Customer Service:omylady Jewelry we sell is good quality, favourable price and exquisite design. To guarantee your complete and total satisfaction, we offer our customers a 60-Day return policy. Please feel free to contact our customer service anytime if you feel unsatisfied or confused . 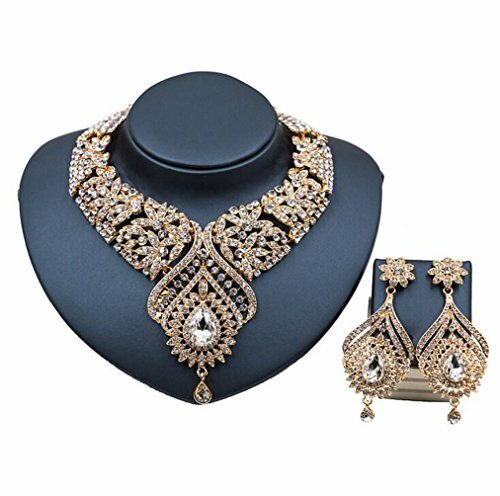 Material:Environmentally friendly material plated alloy, crystal,glass.Special long lasting plating,Lead-Free & Nickle-Free.Sparkling gorgeous bridal prom necklace set.It is so Shiny and Attractive . Suitable for any occasion, Pageant, Wedding, Bridal, Formal, Birthday,Party,Evening, Christmas, Anniversary, Valentine's Day, Mother's Day, Graduation,Halloween or any special occasion. Come with a box, an ideal gift for mom, best friend, daughter, sister, girlfriend, wife . 100% satisfaction and money back guarantee or exchange for free. If there are any problems with the purchase, please feel free to contact us, we will help to fix the problem or make the full refund . If you have any questions about this product by omylady, contact us by completing and submitting the form below. If you are looking for a specif part number, please include it with your message.